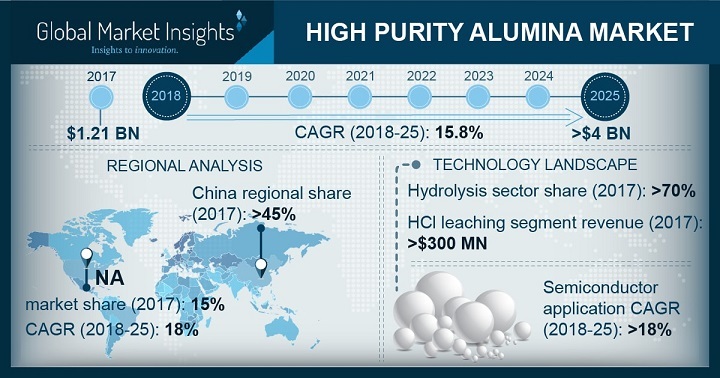 High Purity Alumina Market size will surpass USD 4 billion by 2025; according to a new research report by Global Market Insights, Inc.
HPA is the product of many steps of smelter grade alumina (SGA) purification, which is traditionally extracted via Bayer process, that relies on dissolving minerals from bauxite with caustic soda followed by chemical isolation of the product. The high brightness property of HPA is useful in creation of more efficient and environment friendly lighting solutions and facilitate advertisement display solutions. Synthetic sapphire obtained from verneuil process, a flame fusion process that uses HPA powder for manufacturing synthetic gemstones, are equivalent to natural sapphires. Therefore, increasing usage of the product as a base to produce sapphire substrates will propel high purity alumina market in coming years. Some of the crucial challenges of the global high purity alumina market involve expensive feedstock, scarcity and high cost of skilled workforce, strict government regulations and high energy cost required, which will subsequently result in high pricing of finished products and a relatively low profitability. Due to this, the high purity alumina market is mainly dominated by China due to presence of large bauxite reserves in the region. With over 70% of the industry share 4N high purity alumina will foresee growth at a significant pace due to its huge acceptance in energy-efficient lighting solutions and electronic displays. The 5N HPA will account for over USD 1 billion by the end of 2025, owing to its rising usage in sapphire substrates, electrolytic capacitor foils, electronic storage systems and photovoltaic cells. Based on revenue, hydrolysis technology will capture over USD 3 billion by 2025. This method involves addition of alcohol to aluminum that facilitate hydrolysis of aluminum alkoxide in producing HPA, appropriate level of purity is achieved by removing contaminants such as iron copper, and silicon to obtain the performance benefits such as higher conductivity, brightness and optimal processing. Based on volume, LED’s segment will capture over 50% of the high purity alumina market share. The phosphor segment is said to poise over USD 550 million by 2025. Rapid growth of phosphor-based products such as plasma televisions in which high purity alumina is used to control the characteristics of phosphorous products is expected to grow and help boost the HPA market. Based on volume, North America driven by U.S. will exhibit growth with a CAGR of close to 18%. The regional 4N HPA market is said to capture close to USD 350 million by the end of forecast spell. Global high purity alumina market is highly competitive due to presence of several industry players. Some crucial players in the industry are, Baikowski SAS, Nippon Light Metal Co. Limited, Orbite Technologies, Altech Chemicals Limited, Polar Sapphire Limited, Sasol, UC RUSAL, Sumitomo Chemical, Alcoa Corporation, Zibo Honghe Chemical Company.